Oak is the main timber we use. It is beautiful, hard wearing and if well maintained will last a lifetime. 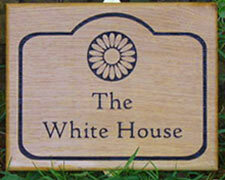 We can create wooden signs to almost any size. 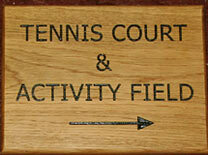 On larger signs, over 150mm in height - we use 30mm quarter sawn oak which, although expensive, is a very stable timber. The lettering and images are sand-blasted into the oak. Letter Colours - We can paint the letters in the following colours - Black, brown, red, purple, white, bright blue, navy blue and green. We can also leave the letters unpainted and send out without varnish or danish oil for you to finish @ 10% discount. Holes - We can drill holes in the sign for you - 2 for a sign 100mm high, 4 for larger signs. Alternatively you could use one of the many adhesives on the market. We have found CT1 or Power Grad n Bond to be very effective. If you can't find locally we can supply . (lasts for up to a year in the tube for other fixing jobs) - UK delivery only. The minimum letter size is 25mm.